pekutherm Kunststoffe GmbH specializes in the production of acrylic and poly­carbo­nate recyclates made from post-industrial, extruded sheet rests. The company is located in Geisenheim (near Wiesbaden). The central location in the heart of Germany allows us to serve all cities and regions in Germany very fast with our own truck. High-quality machines, trained staff and know-how based on many years of experience are crucial for the quality of our services and products and ultimately the key to success. pekutherm owns a modern, fuel-efficient vehicle fleet to pickup plastics and deliver our products economi­cally. Especially large wire mesh containers help collecting bulky materials without additional work steps. A reliable and punctual logistics is an absolute prerequisite for a smooth production workflow. We process the plastic exclusively on high-quality granulators to ensure a careful but nevertheless efficient material grinding. To eliminate dust, we've developed special sifters enabling us to accurately adjust the regrind?s fine portion. You can use recyclates processed in this way exactly as prime virgin resins; crystal clear acrylic or poly­car­bonate recyclates keep their trans­parency and brilliance. All our employees are thoroughly trained. 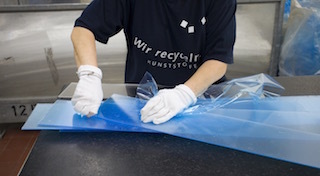 They know that absolute clean­liness and contami­nation-free materials are of crucial importance for the pre­paration and the processing of the scraps, what is especially true for crystal clear material types. Our management possesses 25 years of detailed market intelligence and material knowledge. We exactly know the origin and the quality of all semi-finished scraps we buy, and know what matters in processing them. This is the only way to achieve the quality our customers expect from our company and brings them the decisive competitive advantage.